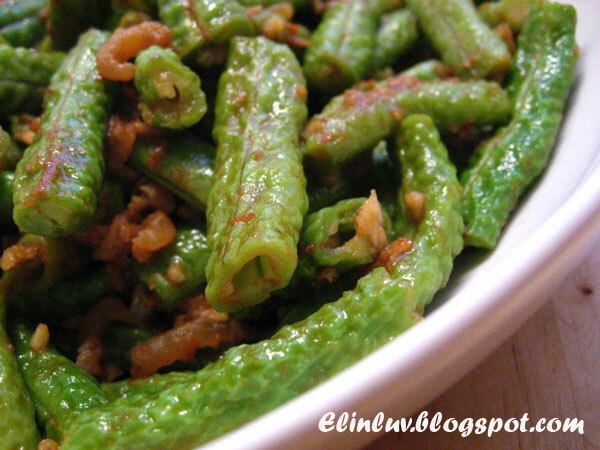 Snake beans are from the long beans family. 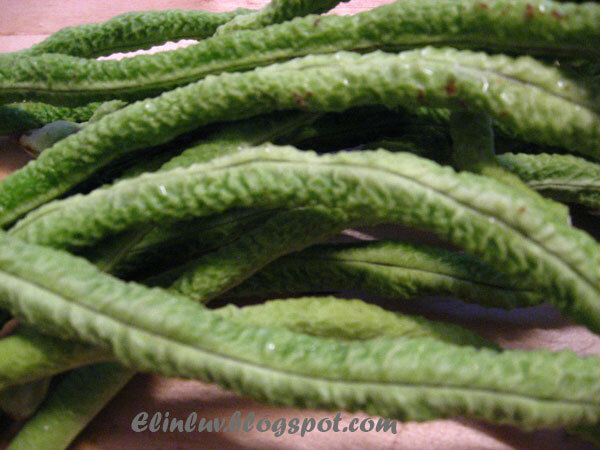 They have wrinkled and thicker texture compared with the normal long beans. They originated from Sabah and I love it for its crunchy texture. You can stir fry them with just garlic and sea salt and you can taste the natural sweetness of the bean. I stir fried them with dried shrimp paste ( belacan ) , chilli paste and dried shrimps and lots of garlic and gosh, it was one appetizing veggie dish and the crunchy texture makes it even more good :) I can eat this with just a bowl of piping hot rice...yummy! Heat up oil in non stick wok, saute the garlic , dried shrimps , ground chilli paste and dried shrimp paste till aromatic, add in the cut beans and stir fry for 5 minutes. Add in 1/4 cup of water. Close with a wok cover for 8 minutes under high heat. Open the cover and continue to stir fry till the gravy thicken and just enough to coat the beans. Dish up and serve hot. Yeah, I always mistakenly thought of them as long beans. I had them stir fried with pork and sambal belacan, at a restaurant in old town. I don't think we'll be able to find these here in the US but we do have long beans. The ones here are skinny and dark green in color. I buy them whenever I see them. Your dish looks very appetizing. Oh I didn't know that this is called snake beans from Sabah. But it looks delicious and with dried shrimp - it is yummylicious! 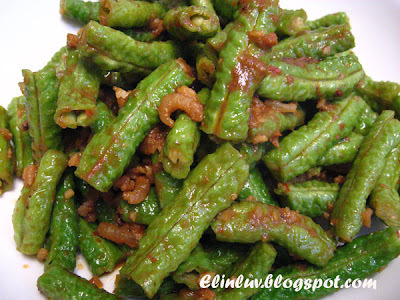 ooo..it's called snake bean ah. I have not eaten snake beans for a very long time...Your post brings back memories. Used to eat them often as kid, in Germany I can hardly have them. I just had this at the restaurant cooked with minced meat, so good with rice! 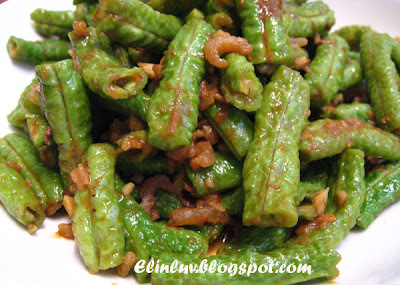 Is difficult to find this type of kacang panjang here. All we get are those very thin kind. 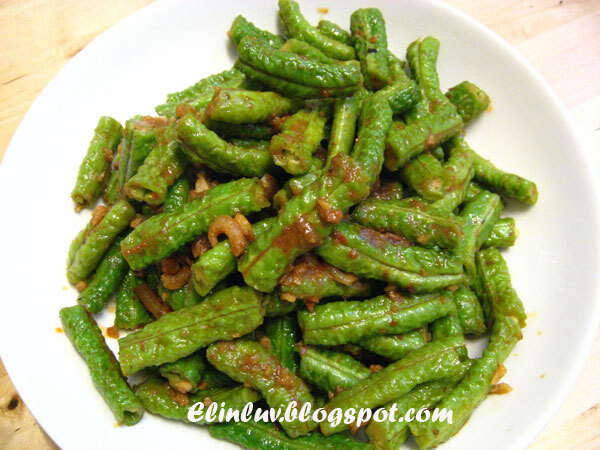 I like this type of beans better and my mom used to cook it with fermented bean paste. yes, eat while it is hot and crunchy.. (song hau) the thick ones are nicer.. yes! James....this is a versatile beans. You can cook it in any style and it will still turned out great :) Old town...oh which restaurant ? 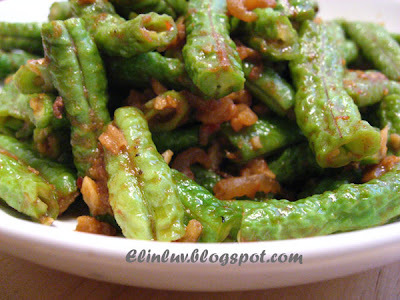 Biren....thanks :) those dark greens ones are crunchy too but this it slightly different in texture though. Thick and crunchy. I love this type the best! All wrinkled and curly... Never knew they're called Sabah long beans. Also cook it wth sambal usually... Nice!